There is no denying that the Bay Area — and especially, the peninsula — is experiencing a housing shortage. There are just too many people and not enough places for them to live. Redwood City’s Council has made Housing one of its strategic initiatives, and hopes to both increase the amount of affordable housing in the city, and to add new protections for community members who rent (while also addressing the unanticipated issues that arose after the Council recently enacted a spate of new renter protection laws). One way in which Redwood City is already making inroads is through the approval of a number of new housing projects. Those of us who live here are well acquainted with many of the projects that are currently underway; they are pretty hard to avoid. But even though we have a great many new and under construction housing projects all throughout the city, more continue to be submitted for city review. Last week, while checking the city’s Development Projects list, I realized that a new housing project had been added. This new proposal, dubbed “Charter Street,” is so-called because it is for a property located at 150 Charter Street. I knew that Charter Street ran along the north edge of the Target shopping center, but from the address alone I found myself unable to guess just where the subject property might be. Naturally, I looked it up on a map. I was a little surprised to learn that the subject property is basically in the Target parking lot. To the casual eye it appears to be just another part of the shopping center that essentially takes up the entire block, but in reality the parcel upon which 150 Charter Street sits is a legally separate piece of land that can be sold and developed independently from the adjacent Target store. One reason I was a little surprised is because what sits there today is a market: Mi Rancho Supermarket. That market, I believe, was remodeled not too long ago, and on the surface seems to be doing well. When I went by to take pictures of the building I did notice that there is a fairly large “For Lease” sign posted in the parking lot, so at least it’s no big secret that this market may not be around for much longer. 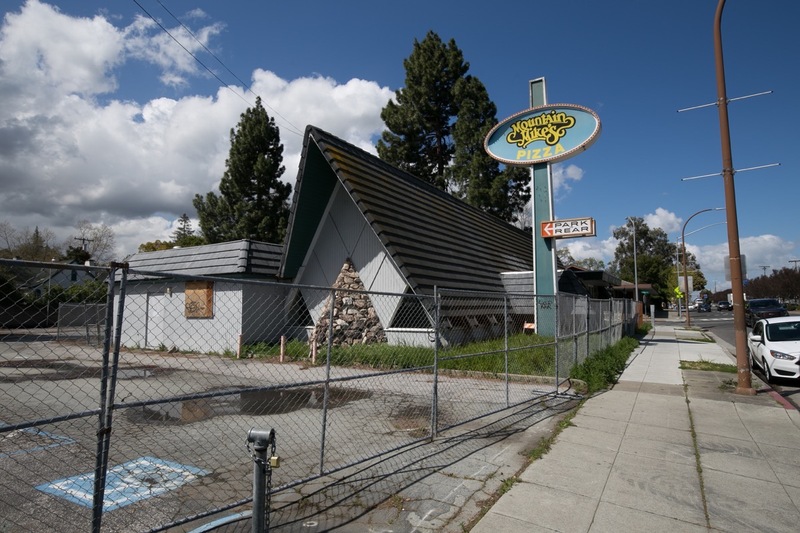 But I would think that the loss of the market will be a bit of a blow to the surrounding community, which, being the Redwood Oaks neighborhood, contains plenty of housing to go with the businesses that front along El Camino Real. 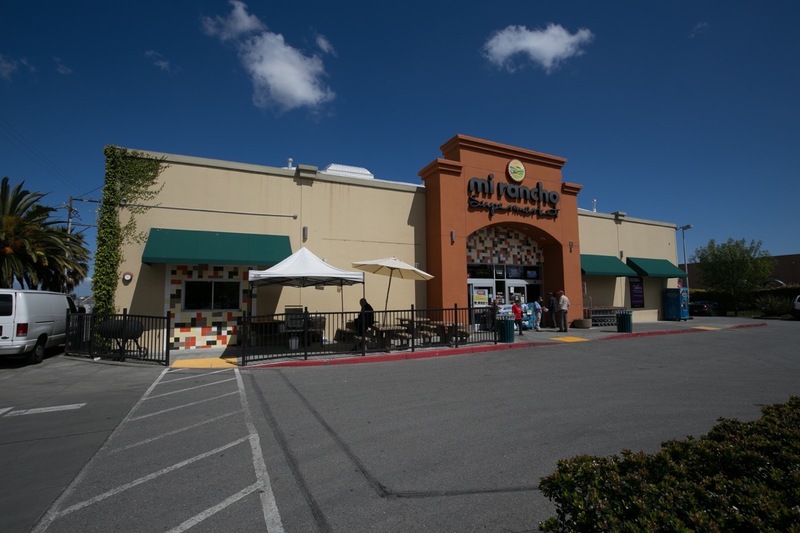 So, just what is being proposed to replace the Mi Rancho Supermarket? A four-story, 72-unit condominium complex. 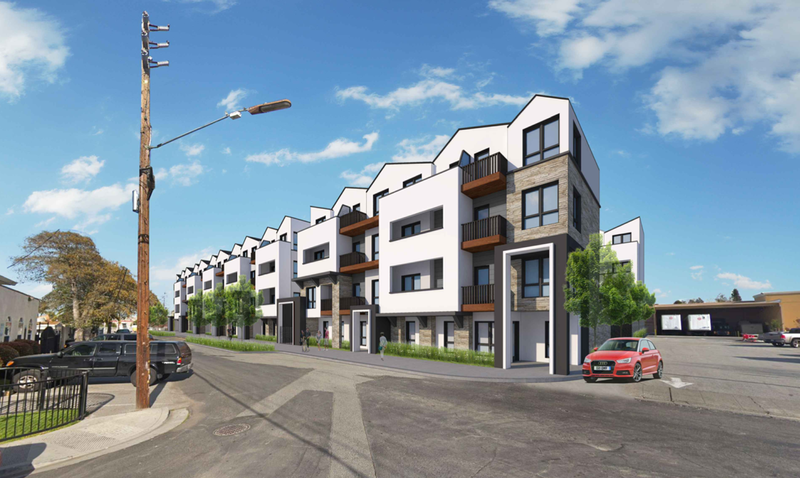 A handful of the units, all of which would be located along the ground floor facing Charter Street, would be two-bedroom, two-bathroom single-level units. The remaining would all be three-level units with living, dining, kitchen, and a half bath on the bottom level, a master suite and a small den on the second level, and two bedrooms and another full bathroom on the uppermost level. All of the building’s parking would be in an internal garage on the ground level, largely secreted behind the single row of ground-floor condominiums. This rendering shows the building’s Charter Street facade. Follow along it to the left and you run into the railroad tracks. The red car towards the right side of the image presumably has just come out of the exit from the internal garage (which cannot be seen in the above rendering). Just behind that car, those two white squares are actually semi trailers unloading into the Target building, which extends behind and to the right of those trailers. The other cars you can just barely see along the very right edge of the rendering are parked in the Target parking lot. From this drawing you can see that the building is actually a set of three-story “towers” above the ground-floor garage. The open spaces between the towers are the building’s outdoor common space, and allow most of the apartments to have a view primarily into the complex. The condos on the Charter Street side of the building (which is to the left in the drawing, where there is an image of a tree) look out over Charter Street, and the light industrial buildings across the way. As for the units on the right-hand side of the building, although their living space looks into the center of the complex, they do have a couple of windows — Juliet balconies off the kitchen and the den, and a window looking out from one of the top-level bedrooms — that look onto the Target building. The above drawing also shows the two garage doors that would open onto the Target parking lot side of the building. There is a matching set of doors on the opposite side of the building (where the train tracks are), allowing cars to drive straight through the building’s parking garage, in one side and out the other. The building relies heavily on tandem parking, incidentally. I haven’t done the counts, but I’m guessing that the three-bedroom units, at least, get two parking spaces in tandem (that is, one is parked in front of the other). There are a number of non-tandem parking stalls, though. I’ll be interested to see how this all works out. 150 Charter is a fairly attractive building, in a slightly odd location. The building faces a handful of light industrial buildings across Charter Street (there are some older apartments nearby as well). Going clockwise around the building, there are the train tracks, the Target building, and the Target parking lot. Hopefully the location means that the land is relatively cheap, and that the condominiums themselves will also be relatively cheap to buy. We’ll have to see though: this project has just been proposed and has a way to go before it comes up for city approval. And assuming it is approved, we’ll be looking at another two or three years before the building is constructed and the units are sold. These are looking good: the landscaping is mostly in, and the exteriors are receiving their final touches. The driveway that runs between the two buildings still needs to be paved, although I presume that that will be one of the very last things that will be done before the townhomes are ready for occupancy. Summerhill Homes (the developer) hasn’t started selling them quite yet (well, they did sell one), although interested parties can sign up on a waiting list. The project’s website indicates that the units will be “priced from the high $1,300,000s” — but that is presumably for the smallest unit, which is a two-bedroom, two-and-a-half-bathroom unit (and there is only one of those — and it is already spoken for). The remaining units all have three bedrooms and three-and-a-half bathrooms, and thus cost more ($1.4 million and up). The most expensive unit is the one on the left in the above image; it is an end unit and thus has more windows, and is one of the largest, at 1,950 square feet. The unit on the right in the above image is actually the largest of the twelve, and although it, too, is a corner unit, it isn’t the cheapest. That unit sits on El Camino Real, and all of the units on the El Camino Real side of the project appear to be between $100,000 and $140,000 cheaper that the ones that are not. Since I’m on the subject of housing, allow me to give a quick status update on a number of other housing projects that are either in the works or in the planning stages, all of which I’ve written about in the past. 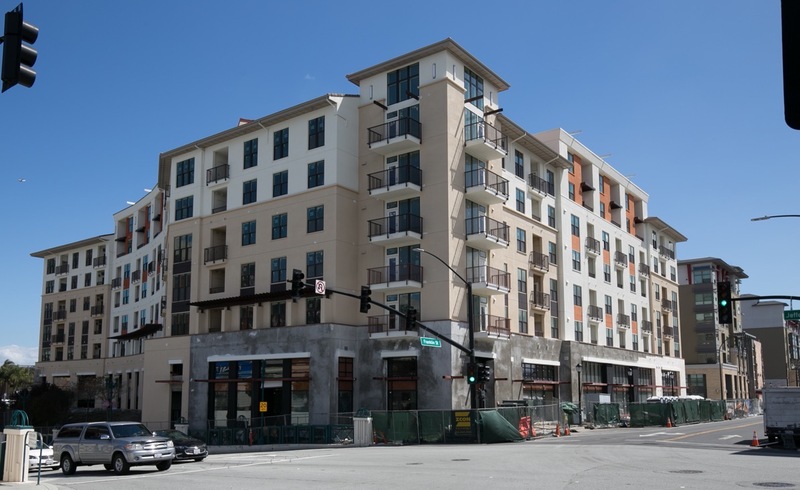 Elan Redwood City, the Greystar apartment project on Jefferson Avenue across from Sequoia Station, keeps plodding along. It appears to be getting close to done, although their website says that pre-leasing will begin in June 2019. Thus, move-in will presumably occur sometime this summer. The building will contain 175 apartments, in studio, one-bedroom, and two-bedroom configurations. I mentioned that the above building was plodding along: this project got the final thumbs-up from the Planning Commission back in October of 2014, the construction fences went up in November of 2015, and the property was cleared of the handful of buildings that once occupied the site in January 2016. So from clearing the land until completion this project will have taken over 3-1/2 years. That’s long, even for a project of this size. I’ll certainly be glad when it is done and I can stop reporting on it, and I’ll be very glad once the adjacent section of sidewalk along Jefferson Avenue is once again open to pedestrians. 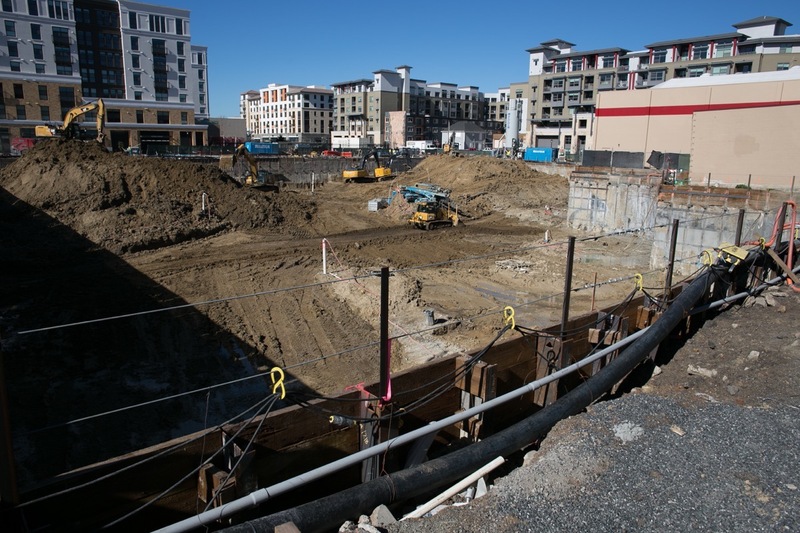 Nearby, the Greystar project at 1409 El Camino Real currently consists of a very deep hole in the ground. This hole, of course, is for the building’s underground parking garage, which will be a large one since it needs to accommodate all of the cars for the residents of the building’s 350 apartments (35 of which will be affordable). 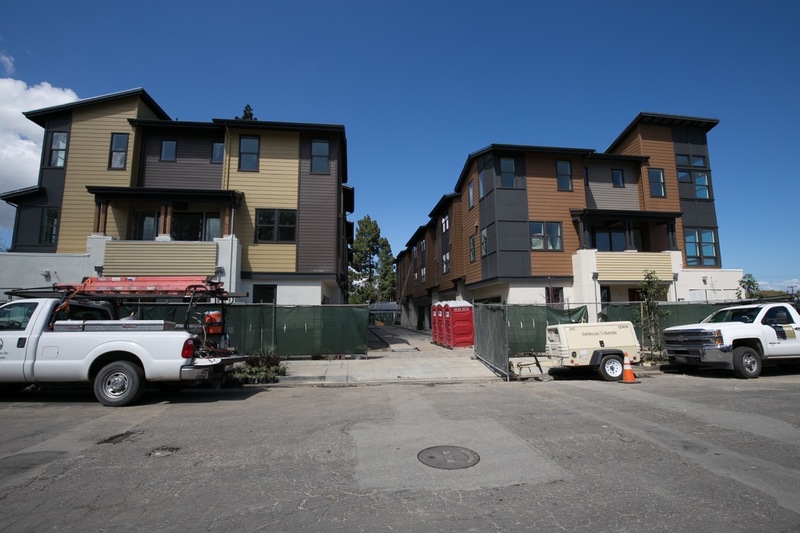 The KB Homes project at the corner of El Camino Real and Hopkins Avenue is still in the grading stage, although it does appear that they will soon be laying utility pipes and then pouring the foundations for the five buildings that together will sport 33 for-sale townhouses. 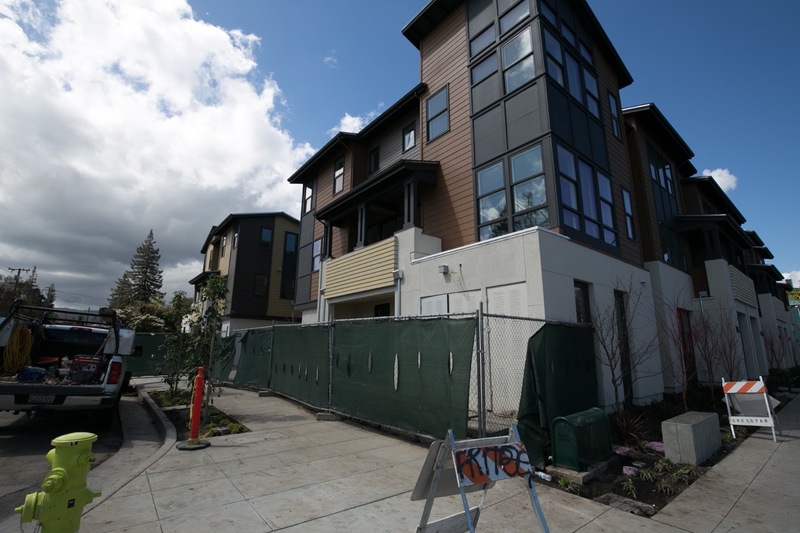 Encore Redwood City, the six-story, 90-unit apartment building (7 of which are affordable) at 849 Veterans Blvd. is essentially complete and is now leasing. Apartments start at $3,300 for a one-bedroom, 1-bathroom, 674-square-foot apartment. They go all the way up to more than $5,600 for a 1,436 square-foot unit with three bedrooms and two bathrooms. There are a couple of other residential projects on the city’s list, but not much going on with any of them at the moment. Very soon, though, the low-income senior housing project at 707 Bradford St. will break ground, as will the Habitat for Humanity project at 612 Jefferson Ave. I am really excited for those two; they will both be extremely valuable additions to Redwood City’s housing stock. Whether or not all of this new housing is enough — will there ever really be enough? — to make a dent in the Bay Area’s housing shortage, we’ll have to wait and see. Certainly, based on all of the development activity, Redwood City is getting its fair share of the Bay Area’s new housing stock. For this post I’ve focused on multi-family projects, but of course there are plenty of single-family homes being built or being drastically remodeled throughout the city. Those I’ll save for a future post. This entry was posted in Walking Redwood City by Greg Wilson. Bookmark the permalink. Is it just me or do the words “condominium” and “townhouse” rarely fit into the same sentence with “affordable”? For all the good intentions, it seems that there is ultimately no stomach for squashing or even balancing high end development in this town. Redwood City is like a newly discovered gold mine and no sheriff is gonna stop the influx of prospectors. Oh and by the way, new research shows that in the long run, rent control (without a host of other mitigating regulations) has opposite and other unintended consequences so let’s not hang our hopes there. Don’t forget infa structure. Yes we’re getting some improvements in water and sewer. But will it be enough for all this growths. I don’t know, but am curious what is the occupancy rate in all these apartments. That’s a lot of money to expend every month for 30 days. That indeed is a lot to be spending each month. But every time I’ve asked, the occupancy rates are very high, so there appears to be enough people who are willing and able to spend that kind of money (not me, though!). Our housing market is shifting, however, so I’ll be interested to see if that shift affects output rental market the same way it is affecting the for-sale market. Is there an equation the city uses? It is really the retailers who have the formulas. They look at population totals and densities and then at competition (from competitors as well as from their own stores) when determining whether to move into an area. The city can suggest sites to various retailers but it is up to the retailers to determine whether or not they can be profitable there. I doubt there are “plenty” of _net_ new single-family homes being built in RWC. It seems all the new homes I’ve noticed being built are 1-for-1 replacements of existing (torn down) single-family homes … and so, therefore, no net addition to our housing stock. This could best be graphically illustrated by a bar chart showing _net_ new housing units built in RWC, by type and by year, going back for up to a decade or more. For every year, I expect the bars representing net new single-family homes would be absolutely dwarfed to near-insignificance by the bars representing net new apartments, du/tri-plexes, and condos! I agree that there aren’t all that many *net* new single-family homes being built (which is one reason why I didn’t use the word “net”), but there certainly are a lot of teardowns out there. I was thinking of the situations where an older home is not remodeled but instead is completely torn down and a new home is built in its place. Unfortunately the majority of dollars for RCSD come from the state based on enrollment, which due to gentrification and other reasons, has declined significantly in the past 5 years. We will eventually move to a basic aid funding formula which will receive much more money from property taxes but reaching that level will take 5 to 10 years. In the meantime we’ve been “consolidating” schools and there will probably be more to come as richer folks move into luxury developments and choose private and charter schools instead of public. San Carlos High was consolidated and sold I wonder how many San Carlos residents wish that had never happened. Does anyone know how close RWCSD is to reaching the threshold to where becoming a basic aid district would make sense? I assume it’s some calculation based off the total assessed value of homes within the district?